As I’ve finally published Volume 2 of the ebook Diary of a Bird Photographer, please bear with me as I begin with a commercial. 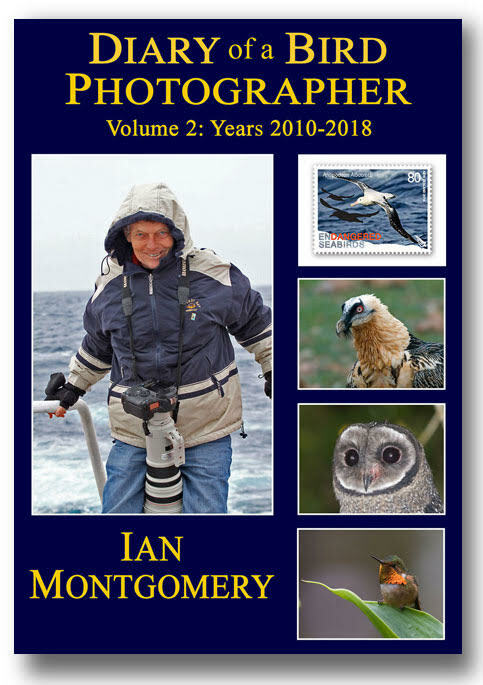 It is a compilation of the more than 240 Bird of the Week/Moment episodes sent out in the period 2010 to 2018. As these episodes grew in contents over the years, the ebook ended up as a hefty tome of 130,000 words and more than a thousand photos,with the fixed format pdf version running to more than 1,100 pages. Like its popular predecessor Volume 1 it is designed for ease of use with many internal links, external links to relevant websites particularly additional photos on the Birdway website, and a comprehensive alphabetical index to bird species. Volume 2 contains a new taxonomic index in case for browsing the episodes by members of particular families such as Barn Owls or Honeyeaters. Read more about it by clicking on the image below or its caption to take you to page on the Birdway website. When I retired and wrapped up the Birdway company, I could no longer sell ebooks through the Apple or Google book stores and I started selling them by gettiing intending buyers to contact me for bank account details. This was inconvenient for everyone concerned – particularly for payments in other than Australian dollars – so I have now started selling them through the Payhip website. Payhip takes payment by credit card or PayPal so you can pay and download the books immediately. The new Diary Volume 2 is priced at six Australian dollars. 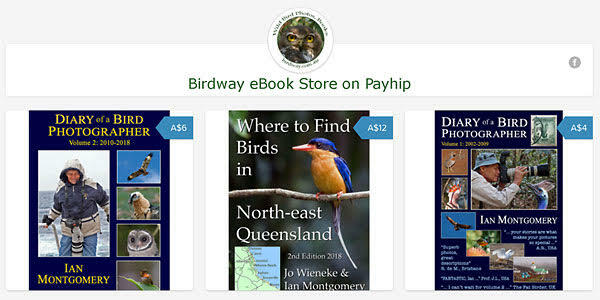 You can visit the Payhip Birdway Store by clicking on the image or caption below. The cover photo of me on the ship the Spirit of Enderby on the trip to the Sub-Antarctic Islands in 2011 brings back great recollections of a memorable voyage, the highlight of which for many of us was the visit to Macquarie Island and its four species of penguins. 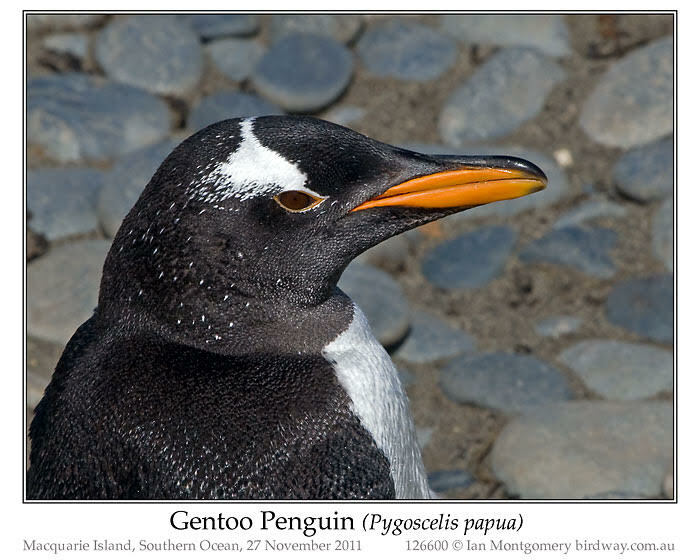 Two of these, King Penguin and Royal Penguin feature as birds of the week in Volume 2, but here is one, the Gentoo Penguin, which hasn’t been honoured in these pages with its fifteen minutes of fame, to quote Andy Warhol. 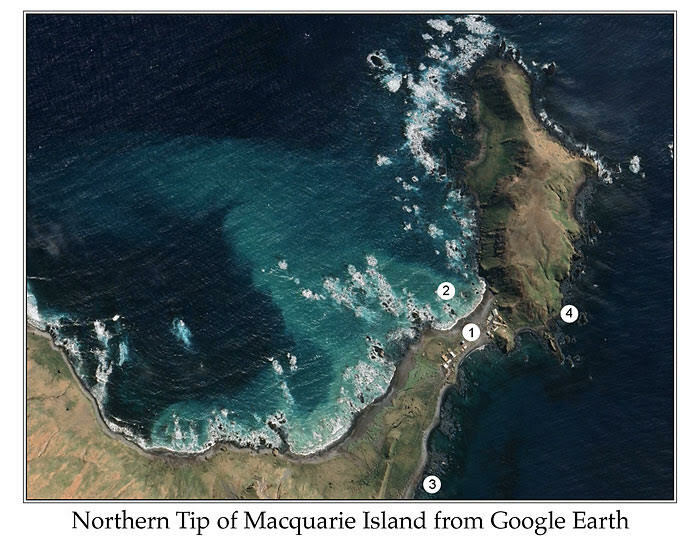 On the morning of our day on the island, the King and Royal Penguins provide us with endless amusement on the main beach on the sheltered eastern size of the island, number 3 on the Google Earth screen capture below. At lunch time we went to the Research Station, number 1, at lunchtime to meet the personnel and we find the Gentoos in reasonable numbers in their preferred breeding habitat, the tussocky grass just south of the station. Gentoos look to me quite small and dumpy in illustrations and photos, but they are fairly large, with a length up to 80cm/32in and weighting between 4.5-8.5kg/10-19lbs. Unlike the curious King and Royal Penguins they don’t take much notice of us and stand or lie around looking rather bored. 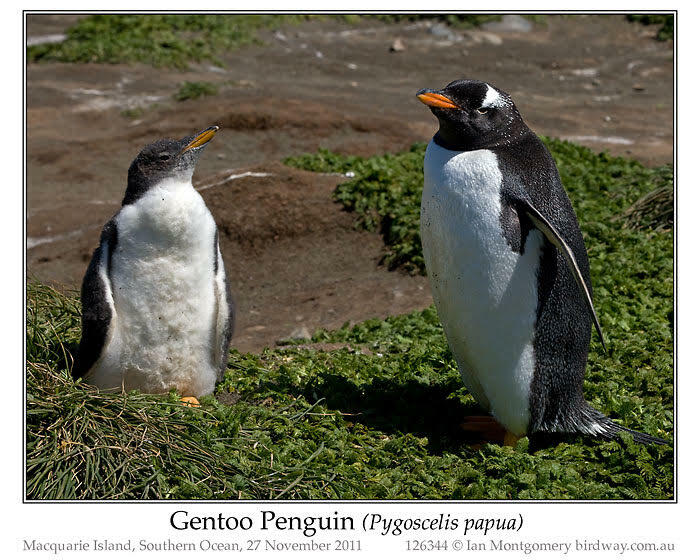 Adult Gentoos, first two Gentoo photos, have a white eye ring, a white patch over each eye and a white line joining the two patches across the top of the head. Their plumage is blackish and the bill and legs are brightly coloured, red or orange. Most of the Gentoos have finished breeding bur their are still a few juveniles in the breeding area, like this rather woolly individual on the left below below. Unlike other Penguin species, Gentoos will relay if the first clutch is lost, so maybe this has happened here. Gentoos are unusual in that the parents continue feeding the young for up to two months after they have fledged. Unlike the Royal and King Penuins on the sheltered eastern beach, the non-breeding Gentoos show a preference for the exposed beach on the western side of the island. The beach in this photo faces northwest and is shown and number 2 in the Google Earth image above. 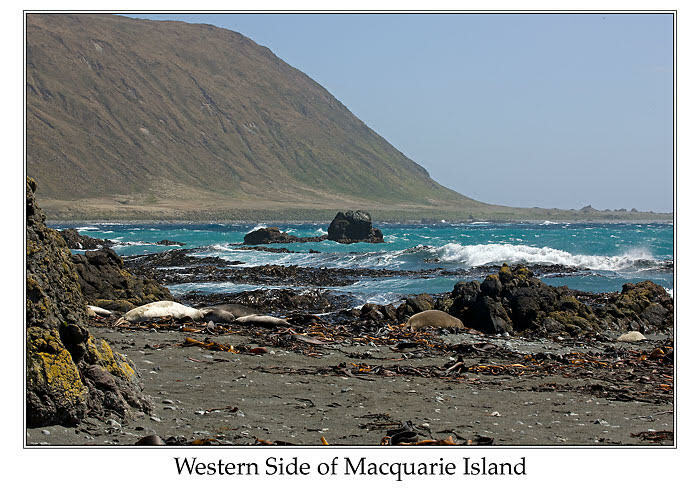 This beach is also popular with the Macquarie (Imperial) Shags which are busy ferrying seaweed as building material for nests on a rocky headland. The thick-skinned Elephant Seals are also at home on this beach and you can see their prostrate forms in the photo below. Immature Gentoos are to be seen wandering around on this beach either full of the joys of Spring (next photo) or pretending to be Elephant Seas (following photo). You can see that their plumage is browner than that of the adults, the white supra-orbital patches and eye-rings are incompletely developed and their bills and feet are less brightly coloured. Gentoos take two years to reach sexual maturity but I suppose, given their proximity to the nesting colony, that these ones are older juveniles from the current breeding. 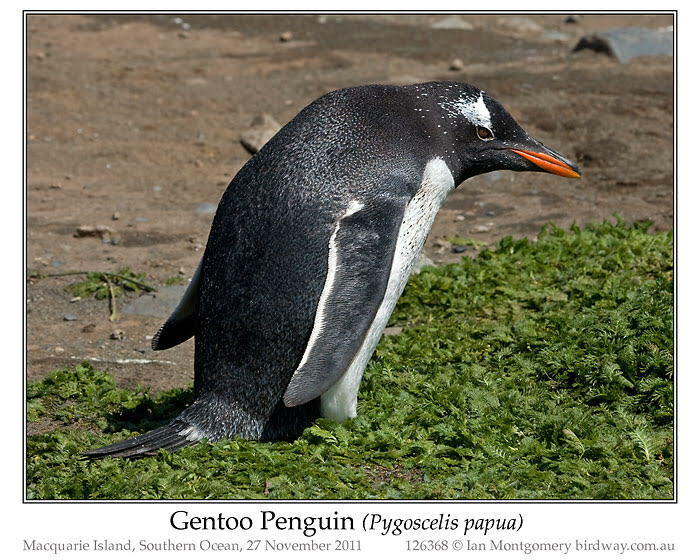 The Gentoo is the most northerly of the three species in the genus Pygoscelis and its circumpolar range is mainly north of Antarctica, breeding on Sub-Antarctic islands in the southern Indian and Atlantic Oceans. The only place it breeds on Antarctica itself is on the Antarctic Peninsula south of South America. The other two members of the genus, the Chinstrap and Adelie Penguins, have more southerly ranges particularly the Adelie. The specific name papua, odd for a Sub-Antartic species, does in fact refer to the natives of New Guinea as J.R. Forster, who named it in 1781, as he thought erroneously that they had curly feathers. The fourth species of Penguin on Macquarie is the Southern Rockhopper Rockhoppers indeed, they are not to be found on the easily accessible part of the island where we spend the day. In the afternoon we return to the ship in the Zodiacs and do a detour via the rocky headland shown as number 4 on the Google Earth image to have a look at them. I’ve been leading a fairly sedentary existence since my last visit to Europe three years ago. Editing Volume 2 of the Diary has given me itchy feet, so a visit to South America this coming October is being planned. 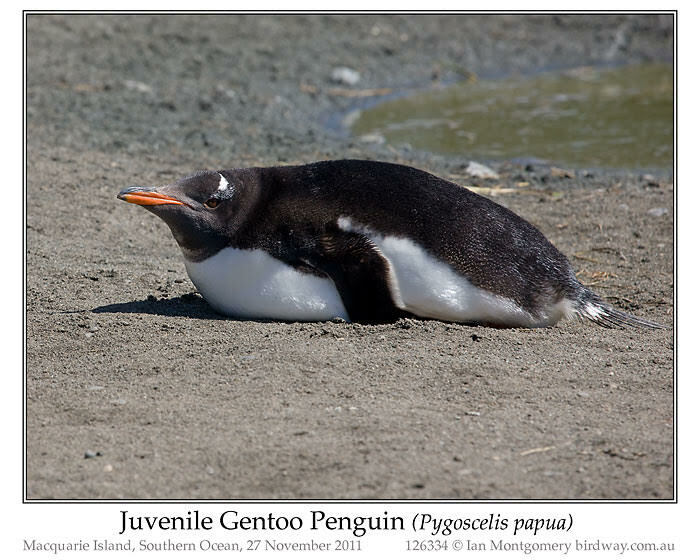 They may swim in the sea, but those Gentoo Penguins are still birds. Thanks again, Ian, for another Bird of the Moment. They are always a welcome surprise when they arrive. Glad you were able to complete your second volume of the Bird Photographer Diary. We have produced many of those Bird of the Week articles here over the years. We have been enjoying your adventures around the world as you seek our Avian Wonders. 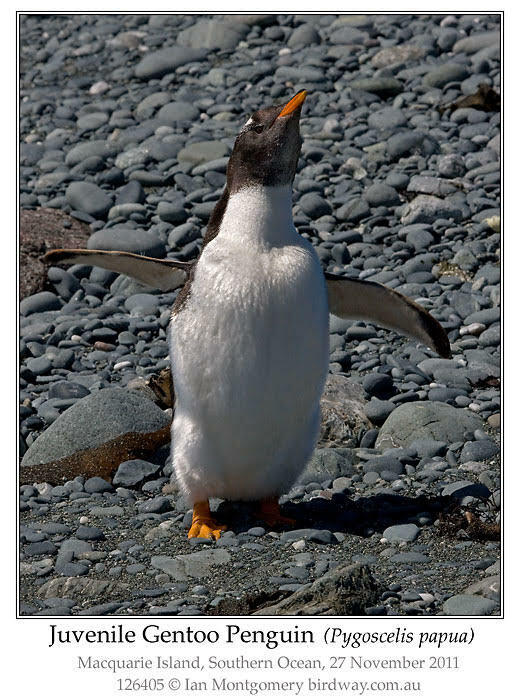 This entry was posted in Birds, Birds of the World, Birdwatching, Christian and tagged Australia, Creation, Diary of a Bird Photographer, Gentoo Penguin, Home School, Ian Montgomery, Nature, Photographer, Photography. Bookmark the permalink.